What does craft today say about our identity, our community, our society? “Disrupting Craft: Renwick Invitational 2018,” opening Nov. 9, presents the work of Tanya Aguiñiga, Sharif Bey, Dustin Farnsworth and Stephanie Syjuco, four artists who explore these questions by challenging the conventional definitions of craft to disrupt the status quo. Working in a wide range of materials—including ceramics, glass, wood and fiber—these artists all share a dedication to social practice that they convey through their handmade artworks. They proactively respond to contemporary issues by reaching beyond their studios to promote collective engagement. They weave elements of performance and installation art into their work to encourage challenging conversations within their communities. “‘Disrupting Craft’ is the latest project at our Renwick Gallery that is doing just that—reassessing what craft is in a modern world and how the maker culture in America captures an ethos for civic engagement and community building,” said Stephanie Stebich, the Margaret and Terry Stent Director of the Smithsonian American Art Museum. The exhibition is organized by Abraham Thomas, the Fleur and Charles Bresler Curator-in-Charge for the Renwick Gallery of the Smithsonian American Art Museum. It includes more than 50 objects, presenting a range of works by each artist, and is on view at the museum’s Renwick Gallery through May 5, 2019. The artists were selected by Thomas; Sarah Archer, independent curator, writer and contributing editor for American Craft Inquiry; and Annie Carlano, senior curator of craft, design and fashion at the Mint Museum in Charlotte, North Carolina. Aguiñiga is a Los Angeles-based artist, designer and activist whose career is rooted in her community-based projects, particularly within those Latino and indigenous communities that neighbor the U.S.-Mexico border. Her collaborative projects are designed to initiate dialogue about identities. In her “Quipu Fronterizo/Border Quipu,” Aguiñiga asked people crossing the U.S-Mexico border to tie thin pieces of colorful cord together to create a continuous strand that served as a physical representation of the number of people that cross the border every day. Aguiñiga crafts furniture, textiles, wearable pieces, sculptures and site-specific installations that incorporate a wide range of natural materials, from beeswax to wool to human hair. Her work featured in the Renwick’s installation includes hand-felted folding chairs, intricately woven wall hangings and suspended spherical sculptures. Bey, who is a professor at Syracuse University, creates ceramics that range from the utilitarian to the sculptural and purely abstract. Through his work, Bey explores complex cultural histories, including how identity can be shaped through status, power, ritual and, in particular, examining the influence of adornment within certain African cultural traditions. Objects on view at the Renwick include functional pots, large beaded necklace pieces, abstract organic forms and dramatic figurative sculptures pierced with nails and ceramic shards. Bey considers the acts of making and teaching as a hybrid practice, combining theory with practice. He maintains an active studio just steps from where he teaches, which allows his students to see what it means to be a professional artist. Farnsworth was profoundly affected by the post-industrial devastation of his hometown Lansing, Michigan, and subsequent artist residencies in Wisconsin and North Carolina where he witnessed critical moments of social unrest. 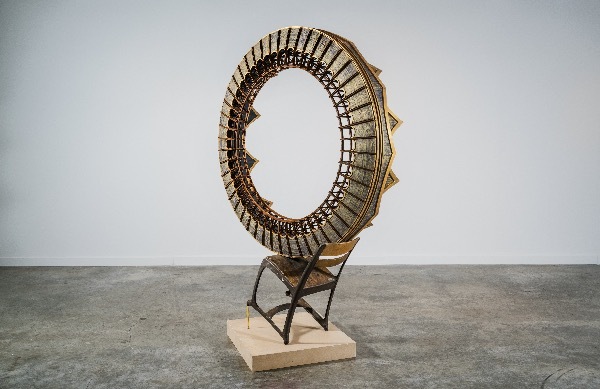 He works primarily with wood to create intricately detailed sculptural works imbued with haunting storylines and nested layers of meaning—from abstract geometrical forms and sculptural portraits to miniature theaters and kinetic works. He produces collective portraits of communities struggling with the aftermath of economic decline, police brutality and high school shootings. His most recent work, “The Reconstruction of Saints,” incorporates audio recordings of young people from Charlotte who share their hopes and fears. This participatory project, with its elements of oral history and community engagement, introduces a new way for Farnsworth to explore the legacy that is being left for younger generations. Syjuco is an installation artist, based in Oakland, California, who uses social practice to challenge perceptions of “types” in contemporary America. In her work, she examines issues such as citizenship and protest, the legacy of colonialism, the value of labor and the ethics of standardized systems of production, often using textiles and needle trades such as sewing and crochet. Recently, Syjuco has been exploring the ways in which information and identities can be masked with digital tools, such as the special effect of chroma-key, more commonly known as a “green screen.” “Chromakey Aftermath 2 (Flags, Sticks, and Barriers),” a monochromatic green assemblage of the kinds of detritus that might be left over after a protest—banners, poles, flags, clothing—uses this concept to suggest that the entire endeavor and its props have been digitally selected and deleted. Short biographies for each artist are available on the online exhibition page. “Disrupting Craft” is the eighth installment of the Renwick Invitational, established in 2000 to highlight outstanding craft artists who are deserving of wider national recognition. To celebrate the opening of the exhibition, the Renwick Gallery will host an open house Friday, Nov. 9, from 10 a.m. to noon when visitors will have an opportunity to talk with the artists; a gallery talk led by Thomas follows at noon. Wednesday, Dec. 5, at 7 p.m., the Art21 episode featuring Syjuco will be screened at the museum’s main building (Eighth and G streets N.W.) in the McEvoy Auditorium as part of the “Movies at SAAM” series; Syjuco will talk about her work the following day, Thursday, Dec. 6, at noon at the Renwick Gallery. Bey will give a gallery talk Friday, Jan. 25, 2019, at noon in the exhibition galleries. The following day, Saturday, Jan. 26, Bey will participate in a “Community Ceramic Demonstration” from 11 a.m. to 1 p.m. at the Smithsonian’s Anacostia Community Museum, located at 1901 Fort Place S.E. in Washington, D.C.; registration is required. The museum’s popular Handi-hour program Wednesday, Nov. 14, from 5:30 to 8:30 p.m. will capture the spirit of “Disrupting Craft” by encouraging participants to create their own linoleum stamp with a personally meaningful phrase or image. Handi-hour Wednesday, Jan. 30, brings back felting as the featured craft, inspired by Aguiñiga’s work in the exhibition. Tickets ($25) for the November program are available now for purchase at AmericanArt.si.edu/handihour; tickets for the January event will be for sale beginning Jan. 7, 2019. An accompanying catalog, co-published with GILES, features essays by Archer, Carlano and Thomas that explore how each artist has used their chosen practice to expand their definitions of craft and inspire collective engagement. It is for sale in the museum’s store and online ($34.95, softcover). The Ryna and Melvin Cohen Family Foundation Endowment provides support for the “Renwick Invitational.” The Cohen Family’s generosity in creating this endowment makes possible this biennial series highlighting outstanding craft artists who are deserving of wider national recognition.